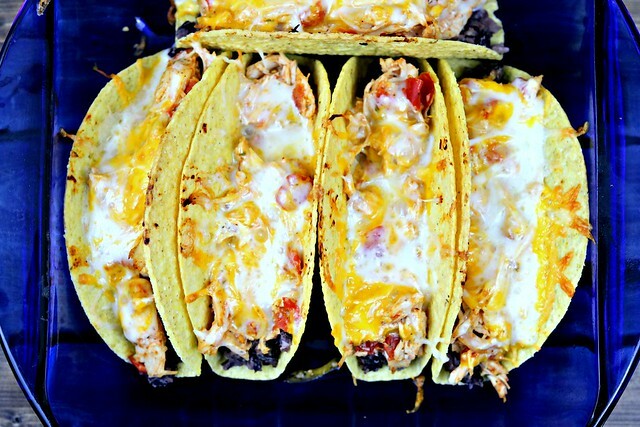 Crispy baked tacos filled with beans, spicy chicken, lots of cheese, and your favorite toppings! Hi friends! Last week was quiet around here, but there’s a good reason, I promise. Ok, maybe not a good reason, but a reason. I caught one heck of a cold, that we only just determined was a cold yesterday. This one was a doozy and pretty much took me out of commission for an entire week. It was loads of fun, let me tell you. But, I’m finally on the upside of things and getting back into the swing of my regular routine. You know, being back at work, blogging, not feeling like I’m dying. That sort of thing. Now if only my taste would come back – it’s been gone for 5 days now – I’d be a pretty happy camper. But for those of you whose taste buds have not forsaken you, I have the most amazing taco recipe to share with you today!! I have made these tacos so many times, I’ve lost count. They are easily one of our favorite tacos. And with as many tacos as I’ve made, that’s saying something. Usually our tacos are of the soft taco variety, but these crispy chicken tacos are perfect. I remember back in high school, when a Taco Bell opened up (this was a big deal in my little town, y’all) and we used to go there for lunch all.the.time. And I would always get the crispy taco meal. Three crispy tacos all delicious and wonderful. Or so I thought back then. And then came a time when I decided that soft tacos were better, because you could roll them up and actually get a bite with all the filling at once instead of a mouthful of lettuce and tomatoes or meat filling. So, I pretty much always made soft tacos from then on. Until these. Oh, and the stand ‘n’ stuff shells…those are a must. They hold more and they are just easier to deal with all around. The problem I had the first few times I made these – if you can call it a problem – was that I overstuffed the initial filling, so when they were done baking and I went to put on all the delicious toppings….there wasn’t much room in the shell for them. It took me a few times to get it right. Trial and error – all a part of cooking! And like almost any taco, the great part about the toppings is that you can adapt them to whatever it is that you like! I like shredded lettuce because it gives a little crunch (besides that of the taco shell.) And of course we have to have guac, sour cream, and homemade salsa! And because we are gluttons for punishment, we add burn-your-face-off jalapeno slices to the already spicy tacos. But you, dear friends, can add whatever you like to your tacos. 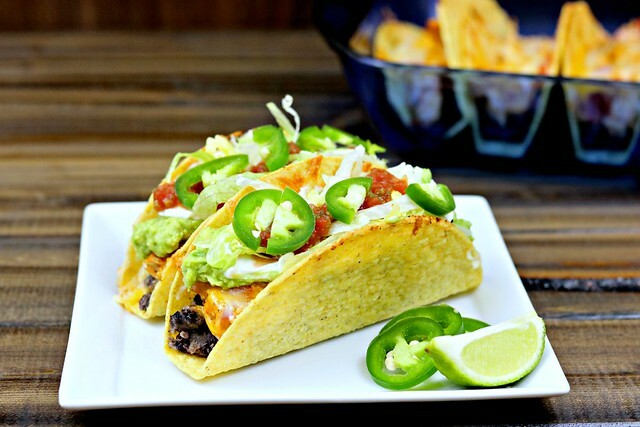 Just make sure you leave about a third of the taco shell open, so there is plenty of room to pile on the toppings! Also, if you are not a fan of spicy food like we are, you can always make adjustments to this to lessen the spice. Like using regular taco seasoning instead of spicy, using regular diced tomatoes instead of diced tomatoes with jalapenos, that kind of thing. They will be delicious, either way. But you know us…we loves the spicy! 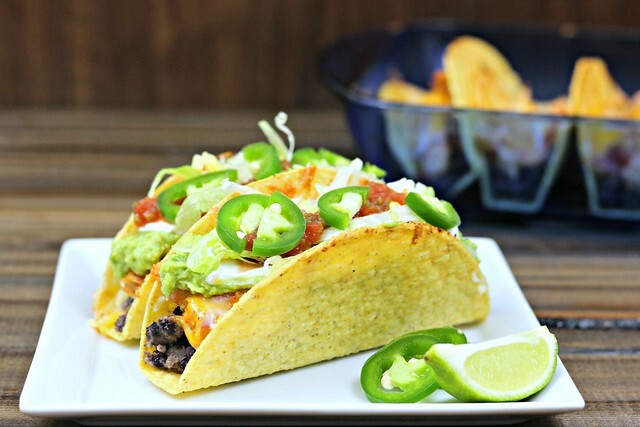 It is Taco Tuesday, and these babies are easy to throw together. So, get to it! Oh, and if you don’t use all the filling for tacos, the leftovers make a GREAT taco salad!! 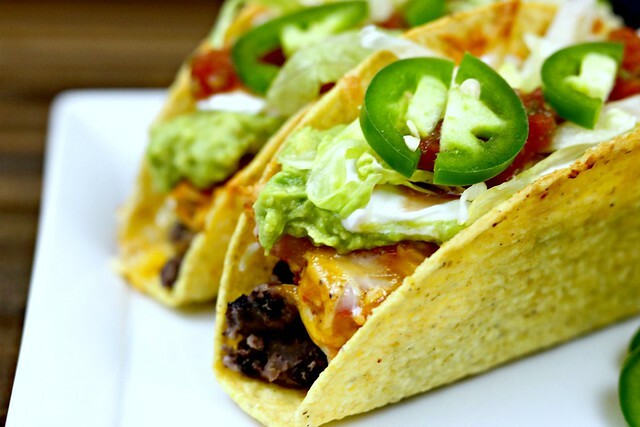 You can use up any remaining toppings, filling, and either taco shells or tortilla chips. Man, I wish I had some right now. And could taste. Toppings of choice: guacamole, sour cream, shredded lettuce, salsa, cilantro, jalapeno slices, etc. The options are endless! Preheat oven to 400F. Spray a 9x13 baking dish with cooking spray and set aside. Heat olive oil over medium heat in a medium skillet. Return chicken to the skillet and stir in taco seasoning, tomatoes and jalapenos. Stir and simmer for about 5 minutes. Meanwhile, place your beans in a bowl, add the cumin, garlic, and salt. Stir to combine, then use a fork to roughly mash the beans. I leave then somewhat chunky, but not completely whole. Place the taco shells in the baking dish, standing up. You may have to do a line of taco shells and then a couple on the side to fit 10. Place a spoonful of the beans in the bottom of each shell and gently spread across so that the bottom is covered. Top with the chicken mixture, leaving about 1/3 of the shell "open" for toppings. Bake, uncovered, for 12-14 minutes or until cheese is fully melted and the edges of the shells are browned. Remove from the oven and fill with your favorite toppings! If you will not eat 10 tacos at once, only bake what you will eat. These do not reheat well in the microwave. Think, stale or soggy shell. I usually make about 5 at a time, in a 9x9 baking dish, all other instructions exactly the same! Also, make sure you drain the tomatoes and jalapenos really well - you don't want to wind up with soggy taco shells. Trust me.